In 1973 my husband and I moved from Dallas, Texas to the sleepy fishing village of Puerto Vallarta, Mexico. It didn’t sleep very long because the world had already discovered the beauty and charm of the place through John Huston’s film, Night of the Iguana, produced in 1964. Reporters flocked to Puerto Vallarta to get a glimpse of the hot, scandalous romance of Elizabeth Taylor and Richard Burton. Many years later, Huston mused about how he had needlessly worried about protecting the innocence of young Sue Lyons while Ava Gardner was chasing brown beach boys through the jungle. It was party-time Mexico for several years, although I did find time to teach English in public and private schools. I also taught in Mexican government offices and banks. Finally, I opened a language school where we offered classes in Spanish and English. My playtime came to an abrupt halt when I was appointed consular agent by the U. S. Department of State in 1982. I served in that position fourteen years. I mixed and mingled with genuine royalty, statesmen, drug barons, murderers, thieves, drunks, beggars and politicians from both sides of the border. I retired in 1996 to what we thought was another sleepy village, Talpa de Allende, which is about a three-hour drive from Puerto Vallarta. A new road from the coast up to our 4,000 feet mountain home brings tourists and natives alike. Talpa is widely known for its shrine to Virgin Mary and we have people from all over Mexico walking to pay homage to the little image throughout the year. It's rare today to find an author who does nothing but write for a living. Do you have a 'real' job other than writing, and if so, what is it? What are some other jobs you've had in your life? Jenny McGill: I’m a so-called retired person, but I’m not retired from the real life. I write for various publications in Mexico and I promote young Mexicans who are struggling with their artistic endeavors. Jenny McGill: I think I wrote it as a catharsis to release some of my negative pent up emotions about some of the grim tragedies I dealt with as a consular agent. Jenny McGill: To be truthful, I think I probably was a writer in another life. As a child, I wrote my dreams – when I could remember them. As I grew older, I dabbled in writing, but other jobs and passions devoured my time. Jenny McGill: The developing years of Puerto Vallarta and my work as a consular officer in a not-so-distant-neighboring country is the ‘meat’ of my book, Drama & Diplomacy: In Sultry Puerto Vallarta. The State Department referred to my work as dealing with the four Ds: Detentions, Destitutes, Disappearance and Death. In D&D, I have covered these and added a few choice ones of my own such as, Dope, Dames on my Path and Dirty Old Men. The book is an anecdotal vignette of all these years. It is an eye-opener to people who wonder about the lives of our government employees on foreign soil. I’ve been told it a fun, informative read. 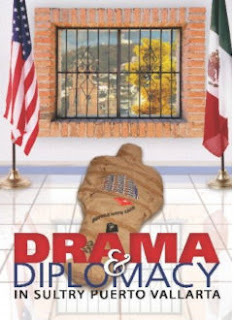 Drama & Diplomacy is my first published book and it is a true story, although I have changed some of the characters names. Jenny McGill: I’m working on a manuscript I hope to have published in the late spring of 2009. Its working title is The Woman in the Trunk. It is a historical novel based on fact and it came about because I saw an antique wooden trunk in a rancher friend’s corral. Its lid was open for airing and showed a portrait of a beautiful woman painted on the inside of the lid. I am fortunate to have been able to trace some of the history of this woman to a German miner who came to Mexico in the mid 1880s, made a fortune and left a legacy. Jenny McGill: Wow! I felt ten feet tall! I almost could not touch it, but I knew it was something I had wanted to accomplish and I had done it! Jenny McGill: I don’t listen to music while I’m writing. Although not strictly disciplined, I usually write in the wee hours of the morning. Where I live, roosters crow, dogs bark, donkeys bray and children cry as the town wakes up to the day. If the weather is nice, I open the windows to hear the birds singing in the big tree in my back garden. Jenny McGill: I am married to a wonderful man who supports and encourages my writing. God willing, we will celebrate fifty years of matrimony in April 2009. We have no children. I am the youngest in a family of fifteen. I have one half-sister still living in Mississippi who will soon celebrate her ninety-fifth birthday. I have so many great-great nieces and nephews, I can’t begin to count them; and yes, they are very supportive of my writing. The main characters of your stories - do you find that you put a little of yourself into each of them or do you create them to be completely different from you? Jenny McGill: The characters in Drama & Diplomacy are real live people. Some of their names have been changed, but they exist/existed. I still socialize with many of them. The characters in the manuscript I am working on now were real live people too. I have to do considerable more research on them, but that is fun also. Jenny McGill: I would not dare to compare my writing with any established writer I know, but yes, I have been influenced by some. I like the humor of Tom Robbins, Jitterbug Perfume, the mysteries of Mary Higgins Clark and the early guidance of Allen Drury, Pulitzer Prize winner with his book, Advise and Consent. Jenny McGill: I still remember how I loved Little Women by Louisa Mae Alcott. My favorite non-fiction authors were Catherine Marshall and Norman Vincent Peale. I was hooked on Daphne du Maurier, loved James Michener’s travels and today I wonder if Taylor Caldwell should still be classified as a fiction writer. Jenny McGill: I don’t think I have a special genre. I enjoyed Jean M. Auel’s Clan series. Danielle Steele, Sidney Sheldon and Stephen King are good companions. I read anything that John Grisham or Tom Clancy write. My non-fiction favorites are Marianne Williamson, Deepak Chopra and Neale Donald Walsch. Hey, let's get morbid. When they write your obituary, what do you hope they will say about your book/s and writing? What do you hope they will say about you? Jenny McGill: I grew up on a farm in the Deep South. Now I live on a hillside in a small village in Mexico. I was born in red clay country surrounded by pine trees and I’m still in red clay country surrounded by pine trees. I’ve seen the world and lived a good life, but I look forward to many more miles to go. Jenny McGill: Pets are a great responsibility I never wanted to accept. Traveling with an animal is difficult and I never wanted to rely on kennels or animal-sitters. Jenny McGill: Oh, how I love this! You are a welcome guest in my home that sits on the side of a mountain overlooking the valley of our chosen village. You have your guest quarters on the top floor completely furnished with its own quasi-kitchen and private entrance. Come downstairs with me and enjoy my wide open kitchen and terrace that looks out onto the valley surrounded by lush green mountains. At this time of the year, it’s a bit chilly in the early morning, but come have a cup of tea with me as we huddle in our warm ponchos. Shortly, we will start our baking for the holidays. Jenny McGill: Television is available in the village where I live, but we choose not to be connected. Jenny McGill: Same as above. Jenny McGill: Drama & Diplomacy, my first and most recent book turned out to be a memoir, although it was never intended to be such. It seems that I have my own unique style, bad or good, and it cannot be compared with others. I enjoy reading and admire many authors. Currently, I belong to a few writers groups and they are extremely versatile. I am one among many and hope to become a major writer. Jenny McGill: It took me six months and I dilly-dallied, but I always knew I would finish and publish the book. It was a MUST with me. Is there anyone you'd like to specifically acknowledge who has inspired, motivated, encouraged or supported your writing? Jenny McGill: Yes, Drama & Diplomacy is dedicated ‘To the man who always knew I would….’ The Editor-in-Chief of www.mexconnect.com who edited the second edition of D & D has always encouraged me in my writing. Sally Conley, a retired literary agent in Puerto Vallarta prodded me when I faltered in the first writing. I appreciate each of them. Drama & Diplomacy: In Sultry Puerto Vallarta by Jenny McGill is available on www.amazon.com. I have a website http://mjmcgill.com, which shows my picture and gives some reviews Drama & Diplomacy has received in Mexico. For about two years I have been published monthly by http://www.mexconnect.com which is Mexico’s largest English e-zine. Beside my writing, I like to encourage the young Mexicans to express themselves in a positive way through the arts. Be it writing, singing, dancing, playing a musical instrument or whatever it happens to be, do THAT and don’t do drugs. The manuscript I have in the oven now will include recipes. I invite all readers to contribute your favorite Mexican or German recipes, especially those with ingredients that might have been found in Mexico in the 1860s. You will be credited with that recipe in my next book. Thank you for this interview, Michy. Come sit on my mountainside with me and enjoy a cup of tea.